10 cool tips to have an amazing time in Berlin and save some money!!!!! 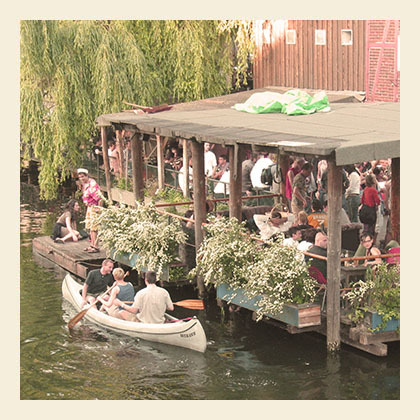 EastSeven Berlin Hostel recommends some cool activities and sightseeing, all for FREE. We have listed up 10 interesting things to see and do in the exciting metropole Berlin. If you want more insider tips you can also always ask us at the reception or check out our online city info and our online staff-recommendations. Have fun exploring berlin on a low budget! is the symbolic centre of West Berlin, an anti- war memorial to peace and reconciliation. Following allied bombing during WWII, the original, west Tower has remained standing as a ruin and is hauntingly named the “hollow tooth” as it is literally an empty husk. Immediately recognizable and located on the Breitscheidplatz at the start of the busy shopping district which includes the Tauentzienstrasse and Ku’damm, this is the only building on the square which was spared by the bombing and deliberately preserved as a part ruin. (text: Berlin.de) A visit to this church is definitely worthwhile and also complete FREE! Every 10, 20 and 50 cent German Euro coin is minted with a picture of this big city gate on its reverse side. Stranded in a lonely no-mans land between 1961 and 89 thanks to the East German government, no other structure in Berlin better symbolises the temporary division of the city. Just go to foot from Unter den Linden and take a closer look at this immense Gate. This Beautiful sight in Berlin is also admission free to visit. A beautiful park, excellent for jogging or having a picnic or barbeque. In the middle you’ll find Friedrichshains highest hill, which provides a 78-metre high view over Berlins flat terrain. The hill was actually man-made to cover up a destroyed anti-aircraft bunker from World War II, as well as several tonnes of bombed out rubble. Also you can play beachvolleyball for free here. They have a special area reserved for beachsports. Its free to use for anyone but you´d have to bring your own equipment. Sunday is fleamarket day. Close to the hostel (500 m) you find the Arkonaplatz Fleamarket and the famous Mauerpark fleamarket. If you don´t want to buy something – no problem, you first of all go there to see all kind of urban subjects with hangover and even sober ones. Berliners go there – you should as well, and ofcourse there is no entrance fee here!